The self-proclaimed mastermind of the 9/11 attacks has asked for permission to share information about Gina Haspel, nominee for CIA director, at her confirmation hearing. Khalid Sheikh Mohammed, who is held at Guantanamo Bay, has asked a judge if he can share six paragraphs of information, the New York Times says. Mr Mohammed was tortured by the CIA following his capture in 2003. Ms Haspel is facing a grilling from senators at the hearing. Her nomination has faced opposition over her role at a secret CIA prison in Thailand where detainees were waterboarded in 2002. 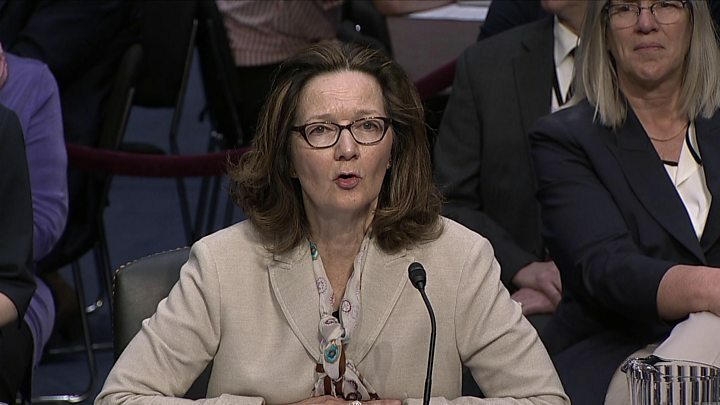 Ms Haspel told the Senate intelligence committee that under her leadership the agency would not restart a secret detention and interrogation programme under which suspects were tortured. She told committee members that, in retrospect, "it is clear... that CIA was not prepared to conduct a detention and interrogation programme". "Having served in that tumultuous time, I can offer you my personal commitment, clearly and without reservation, that under my leadership the CIA will not restart such a detention and interrogation programme," she added. Ms Haspel declined to confirm whether she had overseen waterboarding sessions. She told the committee she supported the CIA's decision to destroy videotapes of the interrogations, saying it was to protect the identities of agents. Senator Kamala Harris asked Ms Haspel if she agreed with a statement made by President Trump that torture works as an interrogation method. She replied: "Senator, I don't believe that torture works." The hearing was briefly interrupted by a protester who was escorted out by police. The request by Mr Mohammed to supply information to the intelligence committee was submitted to army judge Col James Pohl, according to one of Mr Mohammed's lawyers, Lt Col Derek Poteet. The request includes an attachment called "Additional Facts, Law and Argument in Support", which includes the six paragraphs, the New York Times reported. Col Poteet said he was not able to describe the information. It is not clear if the request has been allowed. Khalid Sheikh Mohammed, who is of Pakistani origin but was born in Kuwait, was captured in Pakistan in 2003 and transferred to Guantanamo, in Cuba, in 2006. CIA documents confirm that he was subjected to waterboarding - simulated drowning - 183 times. Ms Haspel, who is President Donald Trump's choice to replace now Secretary of State Mike Pompeo, is facing a tough hearing in the Senate where the narrow Republican majority makes her confirmation uncertain. Many Democrats have spoken out against her nomination. She is a career intelligence officer with more than 30 years of experience but controversially ran a prison in Thailand where suspected al-Qaeda members were subjected to waterboarding in 2002. Correspondents say she was known for her harsh views. The so-called "black sites", where the CIA carried out "enhanced interrogation" techniques, were closed by former US President Barack Obama. However, President Trump has since spoken out in favour of the harsh interrogation of suspects.